IT IS NOT RESTORATION WHEN YOU REMOVE ALL VEGETATION AND ALL WILDLIFE, BULLDOZE EVERYTHING AND CLAIM THINGS WILL GET BETTER IN THE FUTURE. FOR WHOM? Maybe for fish, but what about all the other animals that depend on aquatic habitat? Do you think that the same people who destroy habitat corridors along estuaries and build cement stairways onto pocket beaches really care about river otters? Where do you expect our local river otter population to go? When you destroy habitat, animals die. New animals may travel from elsewhere and replace them, but we have lost a little more biodiversity when that happens. Those cement stairs to the G Street pocket beach matter in the survival of the river otters, who travel between our creeks and our Bay. The G street pocket beach provided food and refuge for the otters on the way to Whatcom Creek. I have watched people deliberately let their dogs off leash at those cement stair because “it is a good thing to chase away the geese.” What else is chased away? Are you still feeling great about those fish daylighting projects, Hamsters? About trails in habitat buffers? About ignoring intensity of use impacts, or the impacts on threatened species? Or any of the other numerous lies our own government tells us? If you care at all, speak up now during the city and county CAO review. This may be your last chance. There may not be any otters left in 10 years during the next Comp. Plan review. 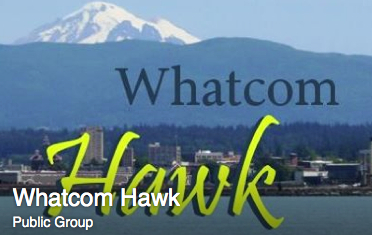 Read Wendy’s post on the Whatcom Hawk Facebook page here. Here’s where to write your letter to the City of Bellingham, https://www.cob.org/contact/boards-commissions/planning.aspx , and Whatcom County planning commissions, PDS_Planning_Commission@co.whatcom.wa.us . Visit this event page on Facebook ( https://www.facebook.com/events/376952439181672/ ) for lots more info on issues and concerns to include in your comments regarding the Critical Areas Ordinance review for the Comprehensive Plan. This entry was posted in Commentary, Facebook Post, Information and tagged Bellingham, biodiversity, City of Bellingham, Comprehensive Plan, Critical Areas Ordinance, G Street pocket beach, Habitat buffers, Intensity of use impacts, Restoration, Waterfront, Whatcom County, Wildlife habitat. Bookmark the permalink.